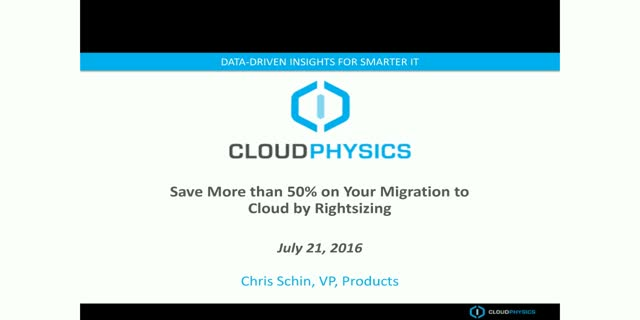 Join this webinar to see how the CloudPhysics Public Cloud Planning Rightsizer identifies opportunities to lower your costs of running applications on the public cloud. This webinar shows how Public Cloud Planning Rightsizer collects resource utilization data from each VM on a fine-grained basis, and then analyzes those data across time to discover the VM’s actual resource needs. Imagine an on-premises VM configured with 8 vCPUs: if the Rightsizer shows that it has never used more than 2 vCPUs, you can Rightsize that VM to a smaller instance in the cloud, saving substantial funds. Learn how to determine your anticipated costs and benefits to make an informed decision on how to securely and cost-effectively migrate your workloads to the Google Cloud Platform without disrupting your operations. Learn how to appropriately model your future state environment for both instance and cluster-based cloud hosting. Learn how outliers and dependencies make major impacts on capacity and costing your future environment. Look at groupings, clusters, and dependencies to ensure all workloads move together to avoid ingress/egress charges for large IO resources. Clear the fog around Google Cloud Platform (GCP) hybrid cloud costing. See how to save costs in a hybrid cloud or GCP cloud migration as CloudPhysics rightsizes, and then calculates costs for your running infrastructure. Segment workloads based on real performance and configurations—then map into Google options for greatest savings. Evaluate hosting scenarios: on-premises vs. hybrid cloud vs. dedicated cloud hosting. We’ll address asset utilization, rightsizing, and licensing for migration. Be the company hero with rich operational and cloud costing analysis. Leverage CloudPhysics to customize and analyze your workloads to understand their potential cost after migrating to Microsoft Azure. Compare workloads and estimate the impact on cost by Azure instance type. Run immediate “what if” analysis on right-sizing initiatives at Peak, 99th percentile and 95th percentile. Understand the financial implication and potential savings of right-sizing your environment before migrating to Microsoft Azure. Leverage CloudPhysics to customize and create your data center cost profile and impact on cost estimates. Run immediate “what if” analysis on right-sizing initiatives at peak, 95%tile & 99%tile. Understand the financial implication of right-sizing your environment in minutes. Leverage CloudPhysics to customize and create your data center cost profile and impact on cost estimates. Run immediate “what if” analysis on right-sizing initiatives at peak, 95%tile & 99%tile, then compare your current infrastructure against the offerings from Microsoft Azure and AWS in a single view. Understand your total cost of remaining on-premises IT with your new cloud infrastructure. Join this webinar to get a look at the CloudPhysics “Global State of the Data Center Report, Q4 2016,” identifying some key trends in data centers for the fourth quarter. CloudPhysics’ SaaS solution extracts data from data centers worldwide, anonymizes and aggregates it, and surfaces insights about global trends and changes occurring throughout data center IT. •The cumulative financial impact of rightsizing during public cloud migration would net to $54.7B annually – more than the GDP of 114 nations. •More than 50 percent of the world’s allocated virtual central processing units (vCPUs) could be reclaimed. •91 percent of VMs globally average 10 input/output per second (IOPS) or fewer. •80 percent of an organization’s IOPS is used to access only 20 percent of their storage. CloudPhysics surveyed over 1,200 VMworld 2016 attendees about their specific concerns in managing the vSphere environment. We got down to the nuts-and-bolts of the challenges they faced; what’s changed and what didn’t. People were very forthcoming with their answers—and some of them were quite surprising. If you’re managing a virtual environment, you should know that you have plenty of company in your concerns about tackling some main issues. To further throw light on the subject, we consulted the CloudPhysics Global Data Set for extra content and insights. Join this webinar to be certain of making the right decisions on moving resources to the cloud. You’ll see how to evaluate which workloads are candidates for cloud migration PLUS measure how efficiently you’re utilizing your own resources. The CloudPhysics Cost Calculator for Private Cloud lets you apply basic costing models to determine your actual costs per virtual machine (VM) in terms of power, compute resources, memory, storage, licensing, and more to generate a cost baseline. Now you can apply CloudPhysics rightsizing intelligence to your VMs. See your “as is” costs beside your rightsized costs at peak, 99th percentile, and 95th percentile. Capture savings by reducing workloads to match actual demands and reduce overprovisioning. When mapping your VMs to their public cloud instances, apply the same peak, 99th percentile, and 95th percentile data to reveal cost difference for private versus public cloud. Attend this webinar to be sure you’ve optimized decision-making before you move. CloudPhysics surveyed over 1,000 VMworld attendees, asking them a series of questions related to the challenges, issues and questions they faced in managing their vSphere environment. The results were fascinating. The good news, for anyone feeling the pressures of managing a virtual environment, is this: you’re not alone. In addition, we augmented the findings with unique global data set queries from CloudPhysics to provide extra content and insights. This two-minute video shows how CloudPhysics data-driven insights enables you to instantly determine the cost of running your existing VMware infrastructure on AWS. The Datastore Space Card will examine the storage capacity of all of the datastores in your vCenters and analyze which datastores are at risk of filling up in the near future. You'll see a detailed breakdown of each datastore including the estimated time until it becomes full, the number of VMs, commitment, free space and overall capacity. In the expanded view, you'll be given additional details such as the vCenter managing the datastore and which hosts are using it, the datastore's file system and a list of the largest VM files. The Datastore Space Card is a powerful analytics tool to reference when performing any upgrades or making changes and optimizations to your data center's storage configuration. Analyze not only the configuration data of your data center, but the performance data as well when using the Card Builder. CloudPhysics has created dozens of performance data properties for each category, covering metrics like CPU and RAM usage, Datastore and disk read/write latency, network usage and dozens more. These properties are available for any standard or enterprise users to use right now - CloudPhysics will display up to one week of data for standard users and up to one month for enterprise users. Take 15 minutes to discover the true cost of migrating your virtual infrastructure to the Azure cloud. Today's data centers are highly dynamic and more complex than ever. Each one generates millions of points of machine metadata every day. Without the right tools or data science expertise it's nearly impossible to make sense of that enormous volume of data and use it to drive operational excellence across your organization's IT infrastructure. Watch this video to learn how CloudPhysics uses Big Data Analytics to bring actionable insights to your virtual data center, enabling better virtualization management by improving visibility while reducing cost and risk. CloudPhysics shows you how to deploy your first observer! Join CloudPhysics to learn how we help users proactively identifies emerging performance issues in the virtual data center and then watch us diagnose those issues using our latest root cause discovery feature—Host Explorer. When a VM is starved for resources, it slows down, as does the application it runs. Discovering the underlying cause of the slowdown can demand multiple tools, and hours of effort. If you lack the right tools—that allow you to correlate results simply and visually—you may never uncover the root cause of the slowdown. With CloudPhysics Host Explorer, admins have complete access to all virtualization layer values and metrics needed for root cause analysis, open-ended investigation and exploration. Learn how CloudPhysics is solving IT Ops management issues for virtualization admins through this informative webinar. CloudPhysics provides data-driven insights for smarter IT, delivering unprecedented data center analytics to a broad range of users. CloudPhysics’ agile, scalable SaaS solution continuously analyzes customer environments and leverages collective intelligence to yield actionable results that optimize performance, lower costs, reduce risk, and enable smarter business decisions. Headquartered in Santa Clara, CA, CloudPhysics serves thousands of end users worldwide across major industries and supports a robust partner network. For more information, www.cloudphysics.com.